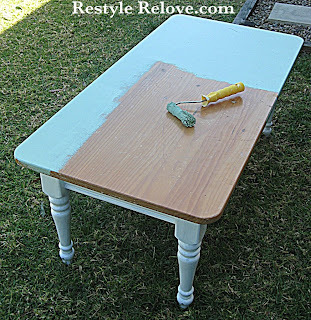 Here is one of my latest furniture makeovers. This gorgeous solid wood coffee table originally came to me with blue legs and a varnished light wood top. I painted the legs white a while ago, and the kids had been using the coffee table in the toy room so it had a few pen and texta marks on top. So I gave it a few coats for shabby green chalk paint, then a sand to distress the edges and bring out some knots. Plus a coat of clear varnish to really make it sparkle. I'm not sure if the photos really capture the colour, but it is the most gorgeous vintage green and was a bargain for $3 on the mistint rack. Lovely color! So simple but charming! You did a beautiful job on this table. It is so lovely. Love the color green you chose. So pretty. I love it! The color is awesome. What kind of clear varnish did you use? Thanks. The color is fantastic--what an awesome find! Love the legs on that table too. Looks perfect!